(In this series, I’m going to go over the process of porting Quake II to MS-DOS. Now of course the question will pop up why? And the answer is simple enough, after [HCI]Mara’akate added in gamespy support, something was noticeably off, and that is fewer and fewer people are playing Quake 1 these days. So what to do? Well apparently Quake II has an active following, so it’s time to move our creeky but favorite OS, MS-DOS into the Quake II Arena! So the first thing to do is to grab a copy of the GPL source to Quake 2, along with a copy of the game, and get started on making a ‘null’ version of the game. Null versions of the game have no graphical output, no sound, and ‘function’ at a very basic level. It’s something to strive for as a first base in hitting that home run of a functional port. Thankfully iD wrote really portable and modular software. Unfortunately they tended to let their ports drift as they were writing the engine so the null code doesn’t actually work out of the box. And the project makfiles leave a little to be desired for me, as they have a bunch of i386/Dec Alpha magic which doesn’t leave much in the room for weird ports like MS-DOS. Now I should mention that before I’d gotten started the first thing I decided that like QuakeWorld for MS-DOS (and OS/2) I would use GCC as it is a known working compiler out of the box. If you can, don’t fight so many battles of unknowns at once. Another thing is that I am going to cross compile from OS X and test with DOSBox. Of course you may want to use something else, and I know my tastes drift, but for now this is what I’m using. I’m using my old OSX to DJGPP cross compiler with GCC 2.95.3, which serves me well. Well that’s great, how to figure this one out? We can see that the vid.width/vid.height aren’t being setup correctly. Turns out there was a bunch more work to be done setting up vid_null! So at one point there was support for ‘hard linking’ in the ‘REF’ video driver, and the ‘game’ logic driver. But it did kind of drift out of the code. But looking at the Win32 version I could see that putting this functionality back in should be easy. And to be honest if I learned any lesson from this, is that I should have been pulling the Win32 version apart by injecting null into it until it ran as a null platform, then use that as the basis. Lesson learned. Always start with a known good! Quake II was built with Visual C++ 6, but I only have Visual C++ 4.2 installed on Crossover. Yes I know again this is me being difficult. But it didn’t take much time to get a simple project that has two DLL’s and a Win32 exe running. Then I took on the ‘ref’ video driver and got that linking inside of the main EXE. Now with one DLL ‘eliminated’ it was time to work on the game dll. The game DLL posed the biggest challenge because it passes a reference to internal functions to it, and exports various functions back to the game engine. So I ended up altering the engine to not call the game import/export directly but setting it up myself. The hardest thing was that I couldn’t pull in the game header file, but rather I had to copy the prototypes myself. Another interesting thing with the way Quake II works is that the game dll has to be able to be unloaded and loaded at will. It wasn’t hard to simulate this, but I wasn’t expecting it. Again this is probably because I never really played Quake II. Now that I had Quake II building without DLL’s I could then take the next step of removing all the IO and re-replacing it with the null code, and now I had something that looked like it was doing something. We can see it pretty plainly. Now since we were going somewhere I started to write some MS-DOS code, and switch out of the null set of mind! Which is exciting and disappointing at the same time. 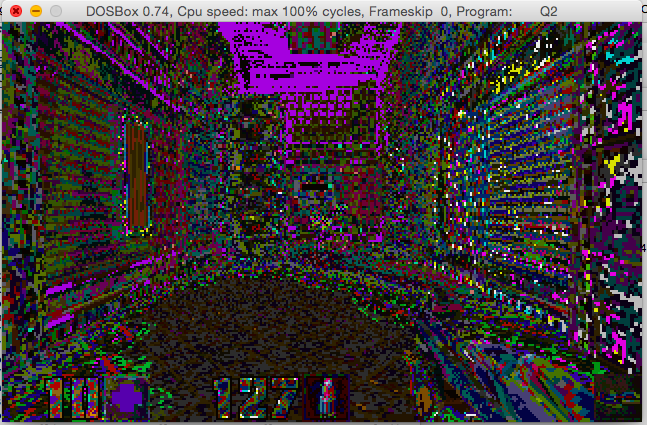 I then took the palette code from DOS Quake, and got something just as ugly. I tried the code from OS/2. Same thing. I tried all kinds of things and was going nowhere. At this point Mara’akate added in the Linux clock code, and now we had this! ** a padded 4-byte xRGB format. In traditional VGA palette setups it’s 768 bytes that needs to be read/and pushed to the card. I even checked Quake 1 is 768 bytes, but now in Quake II, it’s 1024 bytes! OOPS! Sometimes (ok a lot of times) you really need to check other ports or a ‘known good’ to see how they did things. 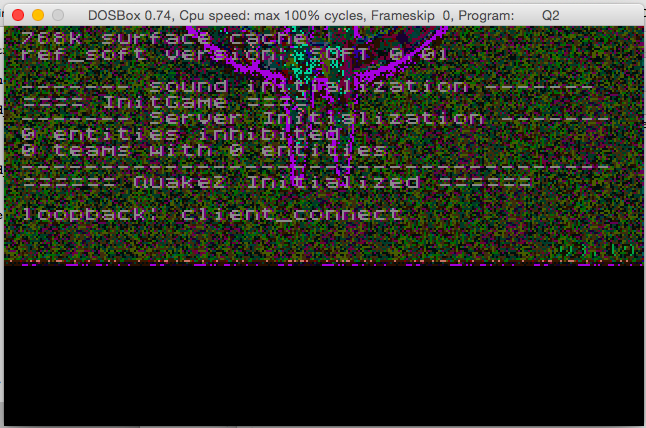 Quake II running on MS-DOS! So where to go from here? Obviously things like better keyboard input, the mouse, sound and networking need to be done. Continued in pt2, pt3, pt4, and part5. Quake3 has no software driver for the 3d support. Instead we would have to rely on mesa3d, which would require something incredibly powerful. While Quake II has been found to be barely playable on a P1 160, I would imagine Q3’s requirements would be something far more beefier, and less likelier to have MS-DOS ISA sound card support. It appears they have a newer version of Wattcp32, and some other improvements. It’ll certainly be interesting if anything to improve QuakeWorld for MS-DOS. I was otherwise unaware of Hexen II’s MS-DOS support, thanks! Hexen 2 is based off of Quake 1.
it apparently has streaming music? how compile to Quake II for MS-DOS ? You will need to be able to build executables with DJGPP. I cross compile from OS X. It really isn’t for beginners. Have you considered the dos allegro library for video/audio handling? If it supports AC97 and HDA then I’d be interested. Modern audio is something lacking in MS-DOS games today. Allegro may make it simpler to write the basic video and audio code, as you know is done for dosbox with SDL. Allegro should also have functions for the other components which are currently set to “null”. Allegro doesn’t support either one. A quick search found two libraries that do, Judas and “WSS”. The makefile shows the list of files used to make the Amiga specific binary. It lists files for Amiga specific sound, mouse, and keyboard code; in addition to other functions. This may provide hints in porting and gluing components together for the DOS version. From a glance, it appears that the Amiga audio is running through a separate library (much like the same functionality in SDL and Allegro for many platforms). 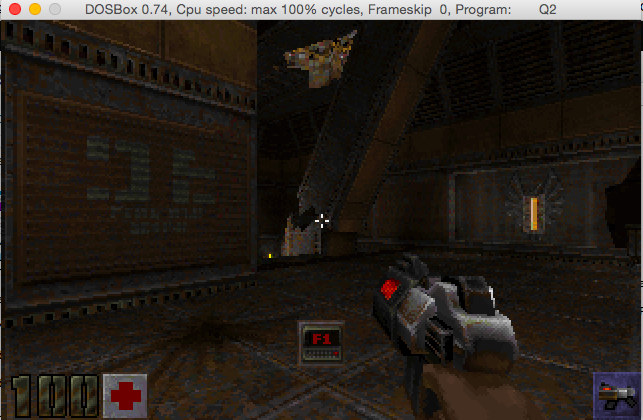 I also started porting Q2 some months ago but started with the SDL-Quake2 version for linux. The source code is available with some searching. These templates may help provide hints, too. Georg Potthast has a driver for AC97 sound  for specific chipsets. And the one doesn’t count, CustomTF for the people, since it’s entirely bots. Thanks for providing the compile guides! I compiled a binary in DJGPP (without requiring the dynamic loaded libraries). I also nearly built a binary in VC6 without the dll files – mainly using Alien Arena source code as a guide for removing the export/import of functions and to reference functions internally. I also made a simple makefile by placing source in a single directory. I noted that the DJGPP SvgaLib is available already built, but it doesn’t contain full functionality (although there are reports of building newer and more functional versions, such as from the mplayer project files). Instead, I followed your method of directly accessing the video mode in the initialization function and it mirrors your result. Also, I linked the WATT32 library which allowed the build to progress instead of halting on missed functions, such as ‘gethostbyname’. Your methods are excellent of both compiling with null functions during testing and finding a working binary without the external dependencies by testing with the win32 build. I noted that the inline assembly is in a different format that gcc, but there are reports that these functions may be compiled outside gcc and then linked with a gcc build. The Winquake source has examples for use of virtual memory, but I think incorporating assembly functions will have by far the greatest impact, given your forward progress. I actually ported over the virtual memory/zone.c stuff in a separate branch and it’s mostly complete. The Mod_LoadAlias and a few other cacheing routines aren’t there. Basically you can load the game, but models and sprites aren’t rendered because their frames aren’t cached. In any case, I didn’t notice a real improvement or stability change by doing so. For now, it’s just dormant unless I decide to finish the rest of that up. Quake 2 already has a very similar version using the Z_* functions and I noticed after I fixed a lot of the issues with sound bugs and tightening up the dos drivers any issues with running out of memory were gone. I was able to load the game and play it just fine with 64MB RAM allocated to dosbox. It’s hard to test on my real computers because the P1 has 384MB RAM and the P2 has 1GB RAM so running out of memory for these games isn’t an issue for me. Hello. I compiled the game with the support of new sound cards, please test your. Is there any chance you releasing the source to your modifications? Yes. I think to make it free. In the future, there is the idea of graphics hardware acceleration (Open GL) for DOS! If you can release the snd_* files and other stuff (you should be as its under GPL). then I can implement the changes to QDOS and Q2DOS. I also see you’re using QDOS source. Any derivative works must be released in source code form as per GPL. If you can share your source modifications that would be cool, as you used our modifications. We would like to add that sound into Quake 2, along with other projects. As you may or not be aware, QWDOS and QDOS are GPL 2.0 projects. Which means that you have to make the source available, which we are now requesting you do so. If I will lay out on my website the files: snd_dos.c and libau.a (library sound cards) this will be enough? Or do I need to register somewhere about the GPL? No, you just have to make the entire source code for the project available somewhere. Posting it to your web page is fine. Also, ZDOOM is not my project, but that is also GPL and you are required to release the entire source code used for the project. For Quake 1, you have to mention that you used the QDOS source code at http://dk.toastednet.org/QDOS and include the readme from that project as I also give credit to any other GPL’d codebase that I used. HI ruslan, we also need the source to the mpxplay library you modified. It uses AU_search which we can’t find and you appear to be using it somehow to set the card. I added to my web page source code for the library soundcards. It’s in our DJGPP 2.05 testing branch right now. Works great on Qemu. Thanks for providing the source, as we were going *NOWHERE* fast, but being able to see the other side really REALLY helped. I assume we can credit you as ‘Ruslan Starodubov’ right? I tested the work Quake2 for DOS. Good work! Few retarding in some scenes. Sound HDA works. (With a slight clicking of 44100). I looked in the file code snddma_dos. There’s little wrong done. This is only for Intel HDA chips embedded in the notebook’s internal speakers. Option -HDA I think the excess (the user may not be aware of it). Just go through all PCI devices and then ISA device. I realized that there were minor problems for syntax DJGPP 2.05. (version GCC> 3). I used DJGPP 2.03. It makes a short code. Servel years ago, i have imagined about porting quake2 to dos, but i dont have the ability to do so. Me too! Surprisingly, it really wasn’t too hard. Quake 2 is very portable on it’s own. And it’s a superset of the Quake 1 driver infrastructure so it was easy to upgrade on that. Play with nullquake, and you can see just what functions you need to make it do anything. At a minimum if you can increment an integer, and blit a buffer to a screen, you too are 1/2 the way to quake! Add in reading a keyboard, and outputing audio and you are home free! Check out the GIT repository, and you can see how the code evolved! Thanks for replying, i will check the git. And what is the next step in your plan? Can I have a version with that fucked up palette? lol it should be easy enough to make, just comment out the ‘padding’ part of the palette! sounds like you’ve got a different build base. What is your make, and where did you get it from? i just download the https://bitbucket.org/neozeed/q2dos revision 2017-12-31. So the Infocom source code base was just 'released'. T'is the season for upgrades!